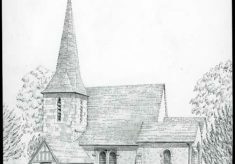 Original drawing by John Clark of the church of St. Peter and St. Paul in Chaldon. The drawing shows the front elevation with the spire on the left. Graves are shown at the front of the church and trees either side. Pencil on white drawing paper.